Nairobi – Naivasha – Nakuru – Eldoret – Nairobi – Thika line (Ruiru) – Athi River – Nairobi -Naivasha – Nakuru – Naivasha – Nairobi – Athi River – Kibwezi – Voi – Mombasa, plus visits to all operational depots and a day visit to TATA’s soda ash plant railway installation at Magadi, including a visit to the line’s depot at Kajaido, and a trip over the entire line to Konza with one of TATA’s own diesels; some optional, some included visits to national parks (Nakuru, Nairobi, Tsavo); time to visit places associated with “Out of Africa” and “White Mischief”, and chance to spend some days relaxing by the Indian Ocean. A series of very positive meetings with the various Kenyan railway authorities in November/December 2013 meant that this tour has been given the “go-ahead” and now that the charter costs have been received, it is clear that we will have been successful in negotiating rates lower than in 2013, which – despite some increases in other areas (hotel/lodge accommodation etc.) enables us to hold some prices at 2013 levels even though we have increased the length and added content to parts of the tour – an extra day in Voi, for example, and the “Magadi Day” is now included, rather than being an “optional extra” Click on the link below for the updated itinerary. Details of this long-awaited tour are now being finalised, several potential problems (including insuring the locos., availability of the English Electric Class “87” diesels which were heavily used on commuter services) having been overcome. A short tour in 2011 (not operated by Enthusiast Holidays!) during which Garratt 5918 “Mount Gelai” failed, eventually produced an agreement with with Kenya Railways Corporation to fund the repairs, the exact nature of the work needed having been ascertained, and the necessary spares located and placed under lock and key! When the contract for the train charter has been re-negotiated, and – apart from some “fine tuning” – is complete – the “steam team” will be assembled, and the work on 5918 – which should take around 3-4 weeks – will be authorised. 2-8-4 3020 is already in great condition, having been worked on in preparation for a charter by a group of Anglican Ministers in October 2013 which did not, in the event, take place. Once the work on 5918, scheduled for this summer, is completed, this landmark tou r will be ready to go! Click on the image of 5918 (below, left) for a short video of the 2001 trip during which “Mount Gelai” behaved superbly, and hopefully will again in 2014. The somewhat artistic shot top left is from Kevin Patience; the picture lower left of a Nairobi commuter train is courtesy Chris West; and that of 3020 (below, right) steaming through the Rift Valley is by James Waite. In building the itinerary, we have had to accept that there are issues about the steam locos’ route availablility. These were addressed at our meeting with Kenya Railways in Nairobi, in November 2011, and again during comprehensive meetings there on February 1st 2013, and the provisional itinerary observes those restrictions, which are largely to do with the logistics of supplying water far from the locos’ home base of Nairobi. Only a certain amount can be carried with us, and where in 2001 there were still water supplies, now there are not because many of the pipes have been stolen! So we have had to identify local water suppliers, who can “top us up” if needed; moreover we also have to buy our own fuel oil for the steam locomotives, so running a trip like this is not for the faint hearted! And for the diesel section of the tour, we cannot go to Kisumu, on Lake Victoria, because theft of metalwork has made some of the viaducts on the line unsafe – so it has not seen any traffic for some years. 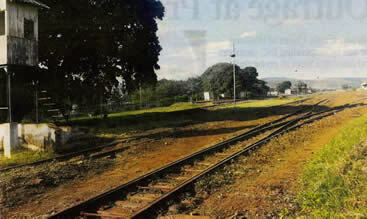 See the picture (courtesy of Kenya’s “Daily Nation” newspaper – showing a rather folorn Kisumu station. As a result we go to Eldoret instead, hence the change of tour name, and of course the plus point of actually crossing the equator! Other discussions revolved around relatively small details – where can the train be stabled overnight on the night whenthe group will not be staying in the lodges; are the station toilets satisfactory, etc. and these facilities have now been inspected and deemed acceptable. 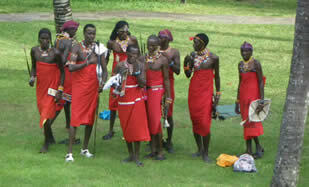 Click this link for the itinerary as it has now developed. We believe that, because the component parts can be taken separately if desired, and there are more options, it should appeal to most enthusiasts, and for the reasons mentioned above, we are in some cases, able to offer more content at prices the same as last year. Click on this “Booking Form” link for prices of each element of the tour. 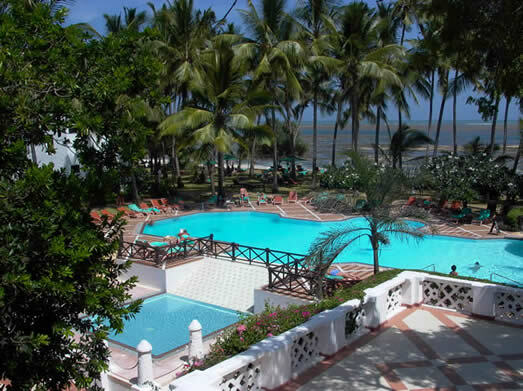 Similarly we will repeat the offer to stay longer on the coast at the excellent 5-star Serena Beach Hotel, pictured below right, for which we negotiated a very special rate per night – £75 per person sharing twin/double room, or £95 in a single, both on half-board basis – because that did prove popular this year. 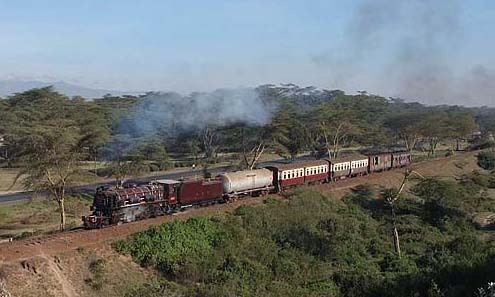 Almost everybody who is familiar with the Kenya Railways steam scene is helping us with technical advice, logistics etc. and to all those individuals we are extremely grateful – in particular, Kevin Patience who is acting as consulting engineer to the project. The country was in the newstwo years ago because of the severe effects of the drought in the North East, bordering Somalia and South Sudan, and whilst the route of our tour is not directly affected by these events (nor do we expect to be kidnapped by Somali pirates as we are a very long way from the Somali border! ), it does underline the importance of ensuring that water is going to be in the right place at the right time, not to mention fuel and other supplies for the trip. The March 2013 elections took place peacefully (unlike those in 2007), and hopefully the country we will visit in November 2014 will be a happy and stable place. Enthusiast Holidays has been working with the Kenyan Railways for many years to get a tour of this kind going, and for your interest this “history”link will take you to some detailed notes about the history of these negotiations. 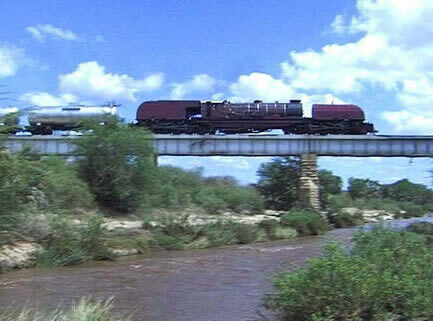 Meanwhile click on the image of 5918 crossing the Tsavo River on our epic 2001 trip, for a short video of that journey. Photo of English Electric Class 71 No. 7105 (above) – the sole survivor of its class, and earmarked for our tour, courtesy of Adrian Palmer LCGB. Photo right, of 2-8-4 3020, courtesy James Waite. This website will be updated from time to time as and when we have news to report about the arrangements for this tour. Space is limited so when bookings open, they will be accepted on a “first come, first served” basis except that those who booked for 2013 will have priority. Once the tour itinerary and prices are confirmed, deposits of £200 per person will be required (other than from those who booked for 2013 and who have kept their deposits with us). 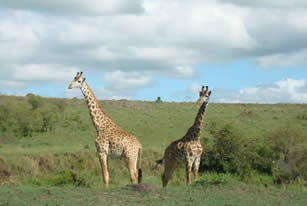 At a later stage, probably in mid-Summer, further deposits may be required to protect hotel/lodge space and airline seats – we are, after all, going to visit Kenya at a peak time for tourism. Final balance payments are likely to be required approximately 2 months prior to tour departure.